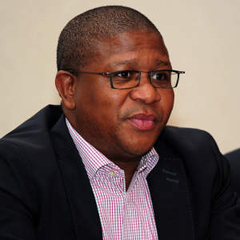 London - Sports minister Fikile Mbalula gave a surprise boost to South Africa’s Paralympic medal winners on Saturday, when he announced their financial incentives would be increased to equal those of their able-bodied counterparts. Speaking at the official closing of eKhaya -- South Africa’s home away from home over the last six weeks -- situated at the South Bank centre in London, Mbalula said Paralympic medal winners would receive the same heroes’ welcome when they land at OR Tambo on Tuesday, and pocket the same monetary rewards as their fellow Olympic teammates. “Anything less would be discrimination,” Mbalula said. “Our gold medallists will get R400 000 each, like our Olympians, and the silver and bronze medal winners will get the same as the able-bodied athletes. “They have done exceptionally well here and we are so proud of them. When South Africa’s Sports Confederation and Olympic Committee (Sascoc) originally announced the incentives in July, they offered Olympic athletes R400 000 for a gold medal, while silver and bronze medals were worth R200 000 and R80 000 respectively. Sascoc president Gideon Sam said, at the time of the first announcement, it was necessary to distinguish between the two contests. "In the Paralympic Games approximately 4 200 athletes are competing for approximately 503 medals, while in the Olympics, there are around 10 500 athletes competing for only 300 medals," Sam said. Mbalula said the Paralympians warranted a special place in everyone’s hearts and embraced the spirit of no surrender. “You have taught us never to give up and you have brought joy and filled our people with hope,” Mbalula said to the South African team. “You deserve a special place and a special honour and we will demonstrate that to you when we go back home. “I know some of you are going to retire and some of you are still young and looking forward. He acknowledged the role of the coaches and said they were “unsung heroes” and paid special tribute to swimmer Natalie du Toit who retired from competitive sport on Friday. “I want to dedicate this to Natalie du Toit who retired yesterday -- the golden girl of South Africa,” Mbalula said as he made his closing remarks. “You came here and brought us gold once more and I know you finished with a silver medal when you wanted a gold. “We also wanted gold for you but we equally cherish that symbol you got yesterday and we will remember how you have inspired a generation. “That is the power of sport and that is the power you all have as the great ambassadors of our country. “And when we go back home, each one of you deserves equally the same treatment as the able-bodied athletes and we will ensure that happens. “So we will not even debate the question of money.